Writing quality content that professors and/or students may be interested in. Bingo! By inserting a keyword related to your niche in the “keyword” section of the above search you will significantly focus your search results and better yet, your results have been tailored to your keyword. From here, it is your job to find the best blogs and blog entries related to your industry and post smart and relevant comments. 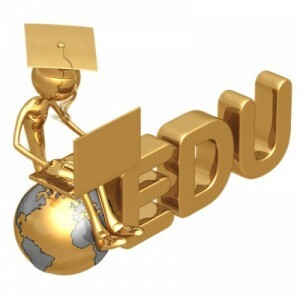 Here you will find the exact location of every .edu backlink that your competition has acquired. You can use this to comment on the same article or to find inspiration for future .edu backlink searches. Once you have found a good blog, it is easy to simply write a generic comment like “Great article!”, hope the owner of the blog will accept your post and you will magically have a great .edu backlink. However, your success rate will be much higher if you comment with insightful opinions and great information about the topic. As a side note for beginner backlinkers, make sure your “name” in your comment is your brand name instead of your real name. You don’t want to find yourself after weeks of hard labor backlinking with hundreds of backlinks with “Sarah” as the anchor text, trust me! Overall, you really want to narrow down a list of relevant university blogs and add great comments that don’t make the owner think you are posting solely for a backlink. While some of these sites will not allow people without university emails to create accounts, it is worth going through the list to find those that do. For example, in my search, the first link on Google allowed me to register with any email. Once I post on these forums, I will have received an extremely valuable .edu backlink. Again, make sure your posts are not spammy, as those that are will most likely not be approved or will be removed soon after they are posted. Try to find forums that are centered on your niche so you will be providing information that will be helpful to those reading and responding to the forum. In the end, the best way to grab those .edu backlinks is to write great quality content. There a few ways you can go about writing this content and getting universities to notice. First, write content that has to do with your niche but also incorporates any sort of new discovery, current event, or even something like the environment. For example, if you sell cloth diapers you might not think universities would be interested in publishing any of your content articles. But if you angle your piece on reusable diapers and how it could save the planet, you might just catch the attention of an environmental science teacher who would publish your article on the university’s environmental science blog. Another approach you can take when writing content is to come up with something new. A great way to get backlinks is to be the first at something in your field. If you are a doctor you could write about a technique that worked on your patient that not many people have used before. If you are a lawyer you can write about a groundbreaking case that you were involved with. The possibilities are endless and it is up to you to find a great angle to take for your content. Once your content is written and perfected, you need to actually get your quality content onto .edu sites. A great way of doing this is through student blogger outreach. Many great university blogs are handled by tech savvy students who are constantly looking for interesting things to post. Today’s students are so in touch with technology that they often have extremely high conversions for outreach placements. There are a few reasons for this. First, reading and sharing information online feels natural to them because they grew up in the digital age. Second, they are constantly connected which usually means they will see your emails and immediately respond. Lastly, they enjoy creating new and exciting content for their blog, which means that if you submit good content, it will most likely make it to their blog. If you are lucky, their contact information will be on the blog. If not, there are a few tricks you can try to find their email address. First, some colleges will have a student directory where you can search for your targets email address. A second method is using an online tool called MailTester. MailTester allows you to enter an email address and verify if the address actually exists on a server. Here you can do a guessing game: most colleges use a combination of a student’s first and last name. So, I would check a few combinations and see if one of them actually exists. If it exists, it’s probably the person you are looking for. Lastly, there is no shame in reaching out through social media. Facebook and Twitter are great ways to find students as almost all of them are connected through one source or the other. I would also try LinkedIn for this step. The reason for this is because those students who do have a LinkedIn will probably have a smaller number of connections and your message will easily stick out. To conclude, following a few simple steps can get you good quality .edu backlinks in a white hat SEO manner. SEO link building is an extremely important step and should not be overlooked. Since .edu backlinks are so valuable in the eyes of search engines, following the steps laid out here can really help your rankings. Remember that the best and easiest way to get your site’s link on an .edu site is to comment on university blogs that can somehow be related to your niche. Remember to find good blogs by using the codes listed above and by spying on your competitor’s backlinks. Also, you can get .edu backlinks by creating accounts and commenting on university forums. It is a little tougher to find good forums that will allow you to make an account without a university email, but nevertheless it can be done. Lastly, the most genuine way to get .edu backlinks is to write great content. This could be about something new and groundbreaking that a university student or professor would be interested in. Approach students and teachers with genuinely good quality content and you may get lucky and get your article published on a university blog. Overall, it is important to remember that .edu backlinks are extremely valuable and should not be overlooked in your SEO strategy.